The opening seconds of The Immigrant show the film’s title on a black screen. The lettering turns from white to red. White – purity and innocence; red – bloodlust, passion, danger. The imagery is simple enough, but our subconscious picks up on the change of colour and what psychological convention has taught us that each signify. A ship glides past an out-of-focus Statue of Liberty; the quintessential symbol of arriving to America, of beginning the American Dream, of starting a new, and better, life – and yet it is cloaked in a foggy haze and too far away to be within reach. There seems to be little room for idealism or hope upon arriving in the New World. Gray begins his film in January 1921. Orphaned, fleeing the aftermath of the Great War, Ewa Cybulska (Marion Cotillard) and her sister Magda (Angela Sarafyan) anxiously wait in line at Ellis Island. Ewa tells Magda to say prayers in an effort to stifle the cough that endangers her acceptance, but when a doctor examines her, she is confined to six months of quarantine due to tuberculosis. “We never go back!” Ewa defies. She resolves to do everything in her power to remain true to her word but in the process will undergo an unfathomable transformation. 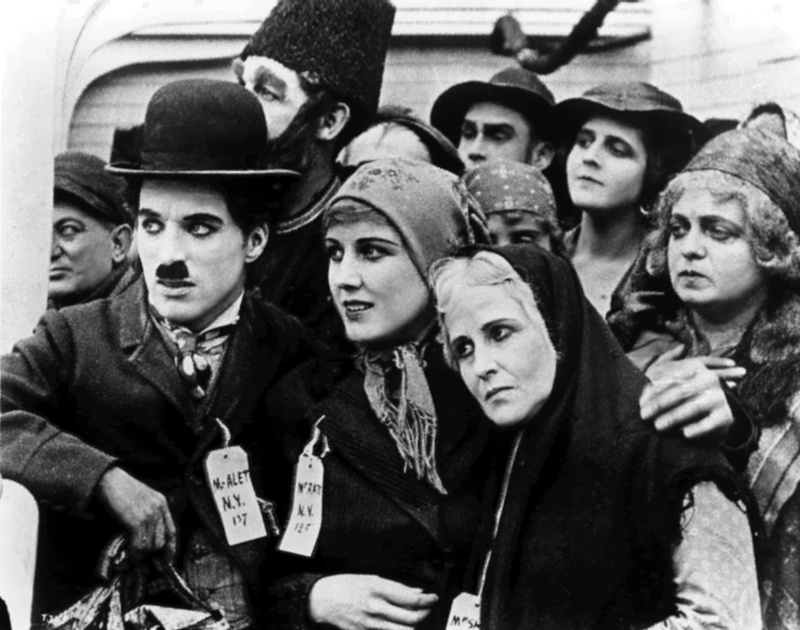 Charlie Chaplin, and others, transfixed by the Statue of the Liberty as they arrive to New York in his masterpiece short film The Immigrant (1917). Unaccompanied, given Magda’s internment, and accused of being a woman of “low morals” due to an unexplained incident on the ship, Ewa’s American Dream appears to be over before it has begun. Luckily Bruno Weiss (Joaquin Phoenix), of the suspiciously-named “Travelers Aid Society”, is lurking and able to help. As Ewa will come to learn, everyone has their price; and Weiss sees something in her that is worth paying for. Wide-eyed, pleading and desperate she is happy to go along with this most unlikely of white knights but are Bruno’s intentions honourable? He promises that Magda will be freed from the island, whether cured or not, but what will Ewa have to do to make this happen? From the first moment of the film to its last Cotillard is able to express so much with her eyes that the camera often rests on her blanched, doll-like face in close-up to allow the formidable actress to express the internal anguish, shame, defiance, desperation and determination that constitute her character. Her eyes truly are the window to Ewa’s soul. No caption necessary. De Niro in the Godfather: Part II. The safe haven to which Bruno whisks Ewa is his apartment. A lot of the film’s action takes place here, and in other interior locations, which speaks to the film’s themes of enclosure, entrapment and restriction; felt by Ewa in the role that she fulfills as well as Magda’s incarceration in the infirmary. The apartment is reminiscent of that inhabited by the young Vito Corleone and the film’s visual aesthetic is instilled with a Godfather: Part II/Once Upon A Time In America sepia-toned authenticity by cinematographer Darius Khondji. The screen glows with the soft warmth of oil lamps, and the muted colour palette is limited between black, brown, tan and grey; only flashes of brightness draw our attention. With the title sequence in mind, the red carnation worn on Bruno’s lapel glows like a warning beacon in this sea of dourness but what threat does he pose? The Immigrant is Joaquin Phoenix and director James Gray’s fourth collaboration. The actor is invariably enigmatic and again finds himself with a character that, for an audience, is hard to decipher. His furrowed brow and softly monotonous delivery belie a seething rage which unexpectedly explodes from nowhere. At face value Bruno is a lamentable character; a pimp who rescues/preys upon helpless women and manages a show at the ‘Bandit Roost’ vaudeville theatre where these women perform, both onstage and off. Despite this, they depend on him and his genuine (or is it?) care for the girls, especially “Lady Liberty” Ewa, goes some way to redeeming his character. His duplicity is one of the plot’s most interesting elements. He wants to help Ewa raise enough money to release her sister but at the same time is possessive and exploits her. I have yet to make up my mind about Bruno, and that ambiguity is testament to Phoenix’s performance. The third point of the unorthodox love triangle that forms is Emil (Jeremy Renner), Bruno’s cousin. A magician, illusionist and all-round nice guy (upon first impressions), his occupation adds to the air of intrigue and mystery – even though he only enters the fray after 45 minutes or so. In contrast to Bruno’s carnation, he presents Ewa with a white rose and when performing for the “detainees” on Ellis Island he maintains that the American Dream is waiting for them. Does he truly believe in this or will it prove to be as much an illusion as his act? Emil and Bruno are opposite sides of a coin; the former an idealist and the latter a realist, and they counteract each other well. Which of the men do we sympathise, and empathise, with more? And who will Ewa choose as her salvation? Will either one of them even be able to gain Magda access to America?Questions that will need to be answered by watching the film yourself. The Immigrant treads familiar melodramatic ground but its rich period setting and its focus on three well-developed central roles mean that it is an engaging watch. It is worth seeing the film for Cotillard’s performance alone – from desperation, to resignation, to resilience and then determination, charting her character’s change from one stage of the plot to the next is quite something to behold. The film does not portray the American Dream in the traditionally optimistic sense of the term, far more an American Struggle, but as Ewa’s auntie (Maya Wampuszyc) states, “the nightingale always sings sweetest at the darkest hour.” Is there hope for the future? Let’s hope so. Posted in 2013 and tagged Charlie Chaplin., James Gray, Jeremy Renner, Joaquin Phoenix, Marion Cotillard, The Immigrant. Bookmark the permalink. TRAVEL! Nova Scotia – Canada’s best province? Discuss.